Make sure you use red and yellow bell peppers for this soup. The colors contrast beautifully with the brilliant green cilantro for a festive dish. 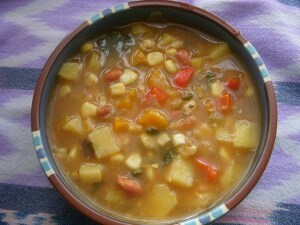 If you prefer vegan chowder, stir in 2 cups of your favorite unsweetened non-dairy milk after your soup is ready. Heat through and serve. 1. In a large stewpot over medium heat, sauté the onion and garlic in the canola oil until the onion is translucent. Add the bell peppers. Stir in 1/4 cup vegetable broth, flour, cumin, chili powder, and oregano. Cook for about 5 minutes. 2. Add remaining 2 cups vegetable broth and water. Stir in Worcestershire sauce. Add potatoes and bring soup to a boil. Reduce heat to low and simmer, uncovered, for about 15 minutes. Increase heat to medium and stir in frozen corn, green chilies, pinto beans, and cilantro. Cook for about 5 more minutes until ingredients are heated through. 3. If making chowder, add soy milk and heat through. Serve with warm tortillas, tortilla chips, or a green salad. Optional: Mexican beer with a lime wedge. What a great way to use up those extra tomatoes from your garden. 1. Remove skins from tomatoes by placing them in boiling water for less than 1 minute and then plunging them into ice water. Cut tomatoes in half, remove seeds, and chop. 2. Combine chopped tomatoes with remaining ingredients. Add fewer or more jalapeños to taste. 1. Place noodles in pot of boiling water; cover. Remove from heat and let stand for 5 minutes. Drain. 2. Meanwhile, in a small mixing bowl combine sugar, oil, soy sauce, balsamic vinegar, and salt. Blend with a whisk and pour sauce over noodles. 3. Mix cilantro with green onions and jalapenos. Combine with noodles and top with a handful of peanuts. Thanks to Rebecca Valencia for submitting her Uncle Bill’s salsa recipe. 1. Prepare the chile peppers by removing the seeds and stems and mincing. For a spicier salsa, reserve some seeds and add to the mixture. 2. Combine the first six ingredients in a bowl. Squeeze the fresh lemon juice over the ingredients and add a pinch of salt. Serve with chips, on vegan tacos, or as a salad dressing!